Thread: Is Powertraining a waste of time? I play this game since 2013 and over the years I also gathered some knowledge (a part of my knowledge got worthless after updates) but still, I know a thing or two. - From my experience an ST is scoring less than an AML-C-R.
- In my theory the best Special Ability(SA) when it comes to scoring goals is the Freekick SA, since I never saw the 1vs1-SA at ingame animations. I once saw Phantomstriker SA but it is so scarce. Freekicks happen a lot in this game so I think this is the best bet on getting additional goals through an SA. - A 3* 18year old offensive player without weak foot (because of Freekick SA), is the optimal player to breed and shape to an "effective" striker. So for this matter I was searching last season for an 18 year old 3* offensive player without a weak foot. I found an AMR and later added the ST and MR positions through training. After positions I trained his Freekick SA. I spent about 120 rest packs for this process. Now all I had to do was powertrain him, I did this allready multiple times, but this time I did not want to create just another legendary player... This time I wanted to create a clinical finisher, meaning powertrain his shooting and finishing stats to 340%. He allready has what I was about to achieve, but when I checked their stats I was very disappointed. 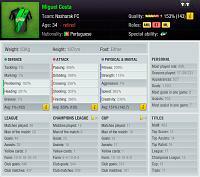 SIR MIGUEL COSTA is the PELE of TopEleven! Approx. 2 goals per game is insanely good for a striker. And I really want a Miguel Costa for my club aswell, but after I saw that even fine tuned offensive players (300+ % in attacking) are not really goalgetters, is a bit of a hitback. From these discoveries I can conclude that there is a hidden value in each player which essentially describes if the player is gonna be clinical or not. What are your comments on this? Should I invest 1000 restpacks to precisely train only shooting and finishing till I hit 340% on each and then move on to physical attributes, or not bother at all and just get his legendary quality. Last edited by Capt.Kaplan; 10-19-2018 at 12:04 PM. Last edited by Capt.Kaplan; 10-18-2018 at 10:43 PM. One is the beloved of asso top 100 teams. To make a mutant squad , staying in the same lv without using those players for official games so to keep those stats and use them only for asso games. The other case is also go for titles, treble etc (so to promote every season). In this case what most of the teams are doing is playing a lot of friendlies, not power training. p.t. is useless for old players with high white skills. Last edited by nikolgiorgos; 10-19-2018 at 05:31 PM. I want the second case (titles, trebles, etc)... but I am insecure about how to approach this after the new update. In 2014 you could buy a player and train(old training) and see if he is a fast trainer and you could also use that guy in friendlies for Freekicks and see if he is good at them. By doing this you could decide if you want to invest in the player or not (if he is worthy of your precious rest packs xD). But today I have no idea on how to determine if the "hidden" value of the player I am about to buy is good or not. I've heard rumors, that the player from your own academy always come with a very positive "hidden" value and are therefore more likely to achieve a 2 goals/game stat. Niko I really don't wanna waste my rest packs since it takes ages to collect them (25 a day). I really hope you can give me tips on how to evaluate a players future performance before investing in him. I also would like to say something personal to you, I really adore your acitivity in these forums (incl. topeleven.info forum). You are a topeleven hero! Powertraining had a sense, when the game had limits of +20 skills (+80%) betweeen attributes, now is absurd cause the margin is too high and, you need to "power mutant-training", cause the normal powertraning (that kept for example a 5-6* avq player with attack skills at 9*) is not enough to create a differance. Yes but is it worth it to have 340% finishing, or is there no difference if you have only 140% finishing and distribute all the rest packs evenly on all attributes? Imo it makes a difference, but not especially for that player, more for the entire team. In a squad full of well trained players, things are a lot easier and you score more goals. But not especially only these particular players who have these high shooting / finishing attributes. And yeah, imo there is a hidden factor for a player. Some have talent, some not that much. Still I think that other players then step up and score goals if your squad is better trained in the white skills. So technically the player contributes to the team success, he just doesn't score that much. It's my opinion, I never had players who were total off if I powertrained them, they were always good players, especially the offensive ones. But skills to 340%? Never gonna get there with the new training, not even with 1000 rests.